uKnowKids Review 2017: Is this Parental Control Software any Good? uKnowKids provides a number of ways to track your kids, but web filtering options are sorely missed. uKnowKids is a parental control suite that takes a unique approach to the new paradigm of kids on social networking sites, offering a fresh solution to a growing problem that many parents of tweens and teenagers face in the modern age. Rather than sticking to a more traditional parental control model of web filtering and content blocking, uKnowKids is just about monitoring social networks and being the one-stop shop for mobile activity tracking alone. But are these two functions alone enough to justify the pricier monthly subscription plan? Read on in our uKnowKids parental control review to find out! Like any parental control suite worth its salt, the setup process for uKnowKids was about as simple as apple pie, though to be fair I’ve never personally made apple pie, so I can neither confirm or deny how easy that particular recipe is. After we had signed up for our subscription, we were guided through the process of adding each child to the network through a handy tutorial. The tutorial not only explained what was needed to get the monitoring software running, it also provided a sample dashboard to navigate through complete with detailed explanations of how the dashboard worked and what features were available depending on how we’d set up our personal configuration. In order to get setup on mobile you’ll need to have your child’s phone on you and unlocked, as there are series of activation codes and credentials that will need to be entered on the device itself before monitoring is activated. While there were some elements of the buying and installation process that left me worried the product might end up feeling a bit dated when stacked up against the competition, I was surprised to find one of the sleekest and best-designed dashboards yet once we were past the setup. Referred to as the “Launchpad” by the company, the dashboard takes a collection of all the different social media networks you’ve chosen to monitor and mashes your child’s activity together on one filterable page. You can switch between increments of seven and thirty days, and choose exactly which social networking accounts are being displayed by clicking their corresponding icons in the top-left corner. Not only was the dashboard beautiful to look at, but the sheer extent of flexibility that it offers compared to some parental control offerings was truly staggering at times. Whenever you’re searching through the feed of their social networking content you can filter down by pretty much any category of action you can think of: Likes, Comments, Messages, and everything else in between. You can see the latest images that have been posted to their feeds, the amount of time they’re spending on social media stretched out over a 24-hour span, who’s contacting them the most, and so much more. Most of the five star awards that uKnowKids earns are thanks to the deep level of control parents get when it comes to scanning and cataloging their child’s social media life, and having it all displayed in one succinct picture from the main dashboard. This makes it easy to quickly take tabs on their social life at a glance, rather than being forced to dig through all the details by hand instead. Of course, for the nosier parents that option is there too, allowing you to search all of their social accounts at once for particular keywords or flagged activity that might be on the edge of acceptable or not. Just in case you aren’t sure what’s a swear word or just slang for the kids these days, uKnowKids provides a handy set of colored codes and information buttons that will pop up when suspicious words or phrases are used on a social media account. For example, on my own Facebook page I was talking about “math rock” in one of my recent status updates. Math rock is a genre of music that’s generally lyricless, so there wasn’t any reason to be concerned there, but what did get a red flag was the word “rock”, which the uKnowKids database (incorrectly in this particular case) assumed could potentially be another word for cocaine. Flags like this are laid out throughout the Social feed, and take on different colors depending on the severity of the word used (swear words get red-on-orange, possible slang gets blue, etc). With this legend in place you can quickly scroll through hundreds of comments, images, or messages at a time, and if you’d like, only look for flags rather than digging into the nitty gritty details of the content itself. This sets a good boundary of trust between you and your child, while also allowing you to keep a general sense of how they’re talking to their friends at the same time. If I had one small bone to pick here, it would be the loading times for some of the more in-depth social network monitoring features could be quicker. Admittedly I liked so much else about the dashboard experience it sounds like I’m really just splitting hairs here, but I test all software we evaluate at Comparitech on a top of the line desktop PC (i7-7700K with 16GB of DDR4-3000MHz RAM on a 256GB SSD), and whenever it came to scrolling through a new part of the social feed my browser would slow down to a near chug to get the next batch of content loaded. For the many different parental control suites we’ve reviewed this year, all of them, despite having an extensive number of monitoring features for Android, come up woefully short on the front of tracking iOS. Now this isn’t the fault of the providers, of course. Unlike Google who basically lets anyone with a handful of binary take root access of your Android phone (the malware stats don’t lie), iOS is notorious for its closed-loop ecosystem that keeps many apps from being able to create monitoring permissions on an iOS device. This is a foolproof method of making sure the number of security vulnerabilities stays low on the mobile operating system, but also makes it difficult for third-party app makers to really take control of the phone in a way a parent might need to for watching their kids. But for every parental control suite which has simply thrown up their arms and admitted defeat, now there’s uKnowKids. uKnowKids is the first (and only we’ve reviewed thus far) app that can actually give you the power to monitor daily activity on your child’s iOS device, including: phone calls, contacts, text messages, location, photos being taken, emails being sent, and more. The software accomplishes this by linking your child’s iCloud account to your uKnowKids dashboard, so every time their device syncs up with the cloud, everything it sends out (text logs, anything written in the Notes app, emails, etc) gets scanned and logged by uKnowKids in transit. uKnowKids can even keep track of deleted texts, just in case your teenager thinks they’ve found a loophole in the system. This level of functionality on iOS makes uKnowKids the obvious choice for any Apple-majority home, or even just Android parents who have a couple of iOS kids running around the house. It also bears mentioning that location tracking on iOS and Android worked in basically identical fashion and was highly customizable. Geofencing options alert you if your child leaves a designated area on the map during certain times of the day, and you can configure exactly how often the phone reports in a new location whether it’s by the day, hour, or even down to the minute. Normally we don’t take an entire section just to delve into the social network monitoring features that a parental control suite offers…but if there were any that deserved it, it would be uKnowKids. The depth and breadth that uKnowKids goes to to guarantee that you have every last bit of information on what your kid is up to online is unmatched in this industry. If your main concern and goal with parental control is being able to have a complete indexable picture of how your child uses social media on a day-to-day basis, uKnowKids is the program to get. It all starts with pretty standard fare: Facebook, Instagram, and Twitter account hookups that use app authorization in order to gain access to the content on your child’s social media account. But, where some apps may only offer a brief glimpse into their online social world like status updates they’ve personally posted, uKnowKids goes above and beyond on nearly every front. This includes giving you a detailed report on every single post they’ve liked, messages they’ve sent/received, comments they’ve gotten/left – the works. Pretty much any and all activity that your child could get into on their social accounts is being logged and indexed here, and are searchable by keyword, activity type, or media type to help you sort through the noise and get to what you’re looking for quickly and efficiently. But wait, we’re not done yet. 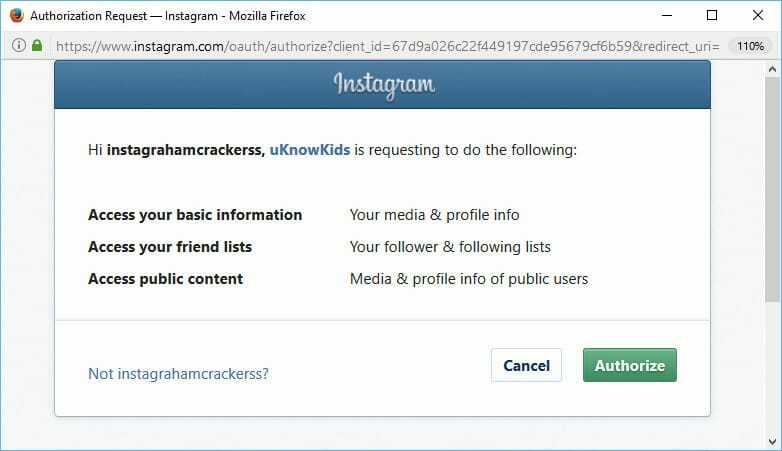 Just in case your child is aware their main social networking account is being monitored and they’re keeping it clean publically (with a secret account on the side to compensate), uKnowKids thought of this, too. 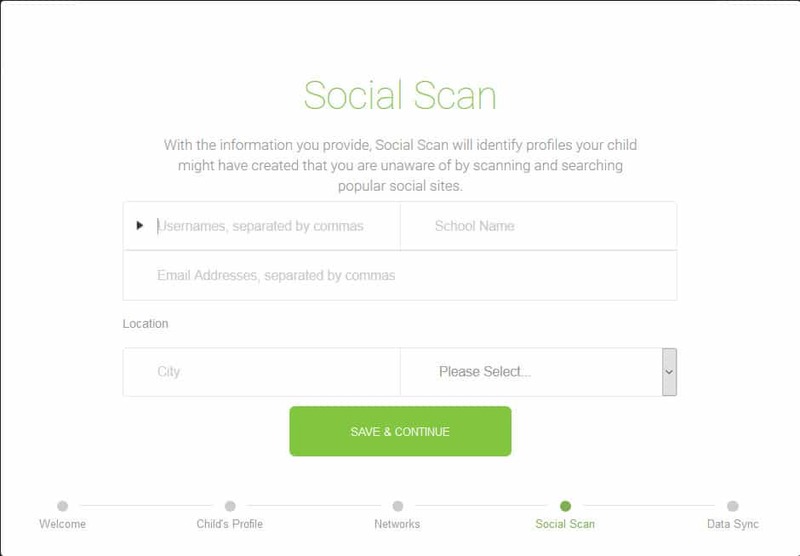 With the help of the Social Scan function, you can type in a vague set of parameters like email addresses, names, or even the school your child goes to in order to locate and identify any other accounts they might have on sites like LinkedIn, Tumblr, Flickr, Youtube and more. If Social Scan finds a match for any of those domains it will give you a link to go view the profile, though unfortunately the ability to monitor account activity in real time is still limited to just Facebook, Twitter, and Instagram for now. Lastly it bears mentioning that although we weren’t able to get our hands on an early invite to use the service before writing this review, uKnowKids is currently beta testing a feature that will apply all the same tracking and logging features it uses on the rest of the major social networks to a whole new range of mobile apps. At launch, these will include: WhatsApp, Viber, Facebook Messenger, Kik, Skype, Facetime, and more. Technically uKnowKids can already give you the contact information from Facetime and Skype calls (who called, what time, duration of call, etc), but once the upgrade is live it’s possible you’ll actually be able to see exactly what kind of content your kids are sending or receiving on popular apps like Snapchat, a first (and only) in the industry so far. As a social network monitoring tool alone, uKnowKids is clearly and without question head and shoulders above the rest. Its ability to reach into every single aspect of a social media account is unheard of among any of its competitors, and so from that standpoint we’d have to give it a 10/10 with extra flourish on top. But of course, social media is only one part of a child’s online experience, and we wouldn’t be doing our duty as reviewers if we didn’t mention the one big, glaring hole in uKnowKids’ resume: web filtering and content blocking. Unlike traditional parental control options which all offer some balance of social network monitoring to actual web content blocking capabilities, uKnowKids skews entirely toward the former instead. That said, the performance on uKnowKids social monitoring was still exceptional across the board. For what the program promises to do, it excels on all fronts, and should be seen as the premier choice when it comes to monitoring your household’s social media use. The pricing model for uKnowKids is more interesting than some other parental control options, only in that if you want to use one of its biggest selling features (the iOS suite), you’ll have to pay for the option upfront. Let me explain. First, there’s the three tiers of Premium membership that start after a 7-day free trial: Monthly, Annually, and Lifetime. These three plans cost $10, $100, and $180 respectively, and include all the social network monitoring and support for all mobile monitoring on Android only. To get the iOS features, regardless of the plan you buy, you will have to pay a $60 upfront flat fee in order to have the full uKnowKids experience. I suspect this is likely because to date uKnowKids is the one and only software suite in town to offer such an extensive list of options for iOS, and although they don’t explain exactly how they were able to pull off so many monitoring capabilities on the notoriously closed-loop operating system, it’s clear they know the value of that and aren’t afraid to charge extra at the door to get in. A $10/mo (and $60 upfront) minimum to get access to only social network/mobile monitoring features might seem steep for some families, especially those who would possibly need to pay extra for another suite to get the web filtering capabilities that most other software offers. 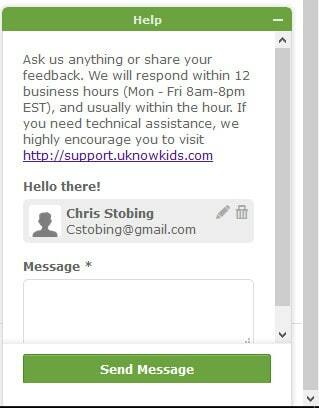 uKnowKids has only one option to contact support, through email, and the company says their average turnaround time is about 12 hours, with a maximum of 24 to get back to you on any questions you may have. We sent an inquiry and got a response back in about 14 hours, well within the range quoted by the company. The answer to our question was accurate and to the point, and from the limited experience we had with our support agent they were able to assist effectively in all the problems we posed both as the initial question, as well as several follow-up queries. Sure, even though uKnowKids may not be exactly what you expect when you hear the term “parental control software” due to its lack of any real content filtering capabilities, what it lacks in traditional features it more than makes up for in social media monitoring to the max. uKnowKids keeps a watchful eye on nearly every single aspect of your child’s online social media experience, while also boasting an impressive number of iOS innovations to boot. In fact, on the premise of what uKnowKids has accomplished on iOS alone I’d say it’s worth the full purchase price, regardless of anything it’s missing on the side. Used in conjunction with another parental control suite (like Norton Family if you’ve already got a Premier subscription), uKnowKids is more than capable enough to protect you and your family from nefarious actors online. With an extensively detailed dashboard, a solid support staff, and enough mobile tracking features to make any parent’s head spin, uKnowKids is undoubtedly one of the best parental control software options on shelves this year. This does not work. Do not purchase it’s a scam for all iPhone users. If my credit card issues them payment I will never use them again. It’s also a scam because it requires you to get all the passwords. What’ stops them from making a brand new account and giving you that password. Our kids rarely text so iCloud is useless. It’s all Snap Instagram etc. so now they make up a new acct and give you that password. This program needs to record anything that happens on their phone without passwords. Does not work! we have been trying to get this iphone, icloud, and instagram linked. NOthing! there is no help! no one to contact for help. The only thing that works in the locator. $15…… not worth it.